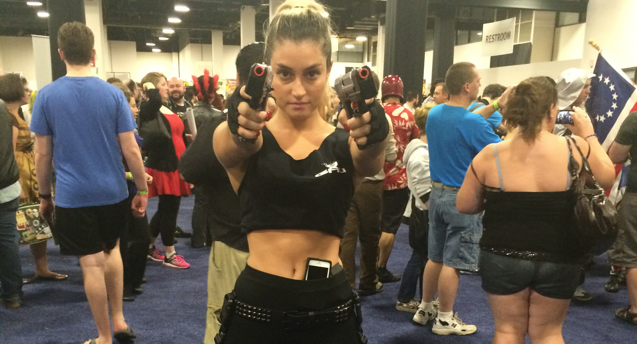 The Best of Boston Comic Con 2014 Cosplay – AiPT! Saturday at Boston Comic Con was a lot of fun and we can’t wait to share the news and stories we’ve got coming your way soon. There’s still another day at Boston Comic Con yet, but doggone it, we can’t help ourselves when it comes to sharing the excellent cosplay on display. We’ve tried to caption these with who they are, but some were baffling, so let us know what they are. Enjoy! And if that’s you in the picture let us know in the comments or over on Twitter @advsinpoortaste! 9:30 a.m., coffee in hand, game on cosplayers…what you got?! A lot of Deadpool at the event. BUT this guy had a sign! Frank Quitely would be proud of this cosplay Cyclops! Flaming Carrot with real flame! About to get real with Bane (Raymond Ramis) and Batman! Zombie Super Mario Brothers. You dig?! Lara Croft looks a bit pissed at the camera man here…concerning. Coming this december, Dominion Legacy! Deadpool is moving in on…Egyptian girl? We’re just glad Spawn had the time to look over at us while Ghost Rider and Deadpool discuss their murders. Joker and Mad Hatter crossover. Yes please! Scarlet Spider-Man and Magik looking boss. Jackie Hunt showing off her great Special FX makeup work! Check her out here. “My personal favorite!” David Brooke said of the Saga cosplayers. Bane, Poison Ivy and Joker together…this can’t be good. We saw a lot of Harley Quinn, but this might be our favorite! Watch those blades Wolverine, we thought you loved Jean! Halo dudes got the place on lock down. When you’re nWo, you’re nWo 4 lyfe, BROTHER! Lady Deadpool holds Russ at gunpoint. Green Arrow shot to the heart! Great Zatanna and Power Girl.